So even though I had an unplanned c-section after almost 36 hours after the beginning of my induction, including 14 hours of pitocin, I probably had an easier time of recovery than a lot of unplanned c-sections because I never tried to push, so I had pretty much no perineal damage. 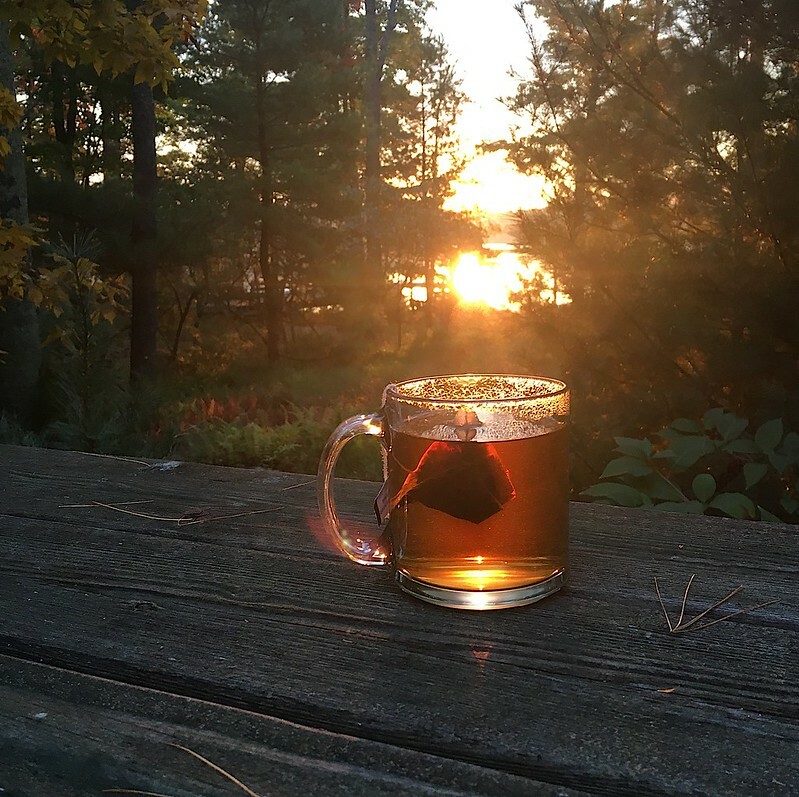 That said, recovering from a c-section is never easy, and I thought I’d share a little bit about my recovery, and the things I found absolutely essential while recovering. Of course everyone is different and every recovery is different. It’s my hope to help other women facing c-section see that it’s not the end of the world, and while recovery may be rough, it’s not impossible. If a c-section is what your body and baby need, you shouldn’t feel guilty about it. And remember that you just went through surgery; it’s okay to need help. This was particularly difficult for me because I was so active before and throughout my pregnancy. To just be able to lay on the couch all day and not do anything more strenuous than nurse my baby was a big shift, both physically and mentally. One thing that helped immensely was some perspective from my husband. About a week after we went home from the hospital, I woke up in the middle of the night with terrible abdominal cramping. Worried that something was wrong, I went in to the doctor to get checked out. She said that I’d strained a muscle. Strained a muscle? I thought. How, exactly did I do that when I’d been doing nothing but lying in bed? 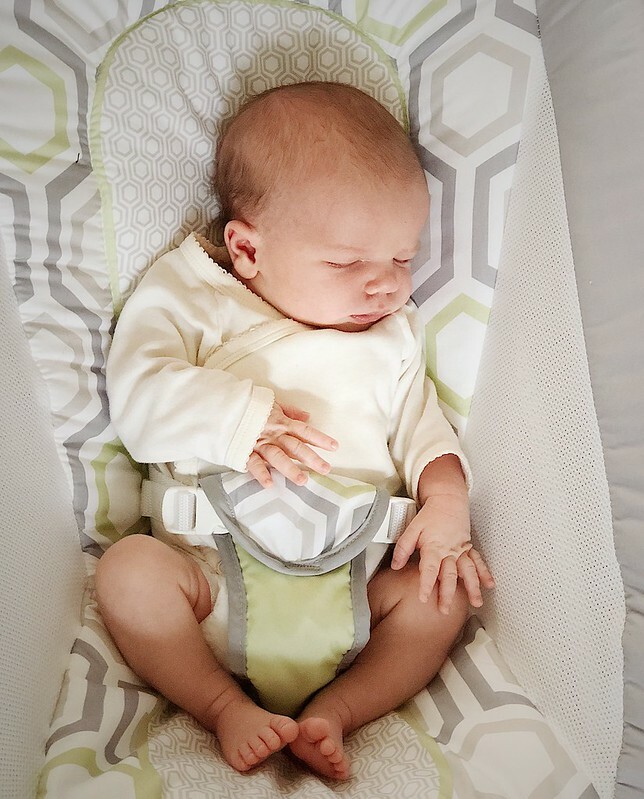 Well, from the location of the strain, I realized I’d probably strained it twisting over to the side to pick up Elliot from his bassinet to feed him. Which was disheartening to say the least. Until Dan reminded me that most people who have abdominal surgery are told not to lift anything, rather than “nothing heavier than the baby,” so it made sense that even lifting the baby could cause problems. My number one c-section recovery essential is a supportive partner. In my case, I was lucky that my husband was not only able to take off work for a month, but willing to stay away from his job for that long. I would say, at the very least, you should plan on someone being around to help you all the time for the first two weeks, until you know how your body is going to heal. I spent all my time laying in bed or on the couch, so I needed Dan to do pretty much everything else. I fed Elliot, but Dan fed the two adults. He did all the laundry. He kept me hydrated. He rocked, burped, and changed Elliot. Heck, when Elliot was still on formula supplements, Dan fed him most of his formula supplements. He made sure that all I had to think about was breastfeeding and recovering. One of my biggest regrets is that I didn’t buy this robe (which I’m wearing in the picture above) sooner. It’s not cheap, but it’s fantastic. It’s soft, thick, comfortable, and the belt is attached so you can’t lose it in the wash. I came home from the hospital with a belly the size it was at five months pregnant, and an incredibly sensitive lower abdomen. Wearing real clothes was out of the question for a while, and breastfeeding meant I needed frequent easy access in the front. This robe over a nursing bra, and some thick socks was my uniform for at least a week. The first few weeks of my recovery, I couldn’t stand wearing anything with a waistband. Wearing underwear was bad enough, but even leggings or a jersey skirt was out for everyday wear. While my robe was perfect for at home, I had to leave the house occasionally for doctors appointments. When that happened, I turned to my maternity maxi dresses. I have this dress in three colors and it’s basically all I wore out of the house, or when people visited, for weeks. It’s soft and comfortable, looks like real clothes even though it feels like a nightgown, and it’s cut ideally for easy breastfeeding access. My doctor clued me in that the perineal cold packs that were in my postpartum recovery bag at the hospital are also great for soothing an angry incision. When I got home and ran through the extras that the nurse gave me to take home, I found these, for a reusable option. They stay in the freezer and I wrap one in a dishtowel to prevent frostbite. Cold on the incision is key. One thing for which I was completely unprepared was how much I would hate my normal underwear when I got home. I used hospital disposable undies for a while, but eventually, I wanted to feel like a normal, underwear-washing person again. I got these from Kindred Bravely, which are fantastic, if a bit delicate (some stitching is already coming undone on a few pairs), and when I went to order more, I tried these, which probably wouldn’t have worked for the early recovery days, but are great now that most of my immediate soreness is done. Seriously, wearing the wrong underwear caused a lot of my worst pain days after the initial healing period. Now that I’m past the initial healing period, I’m still not wearing most of my normal clothes. I stick to soft-waisted bottoms, like yoga pants, wide-waistband leggings, and jersey skirts. I can’t imagine when I’ll ever want to wear jeans again, and I’m pretty sure I’ll keep my maternity skirt in rotation when I go back to work. But just shy of six weeks from the surgery, I woke up one morning and realized that I didn’t hurt at all. And since somehow pregnancy has made me sickeningly optimistic, I will say that the bright side of the c-section was that Dan was able to bond immediately with Elliot and I think it makes it easier for him to soothe El when he’s fussy. 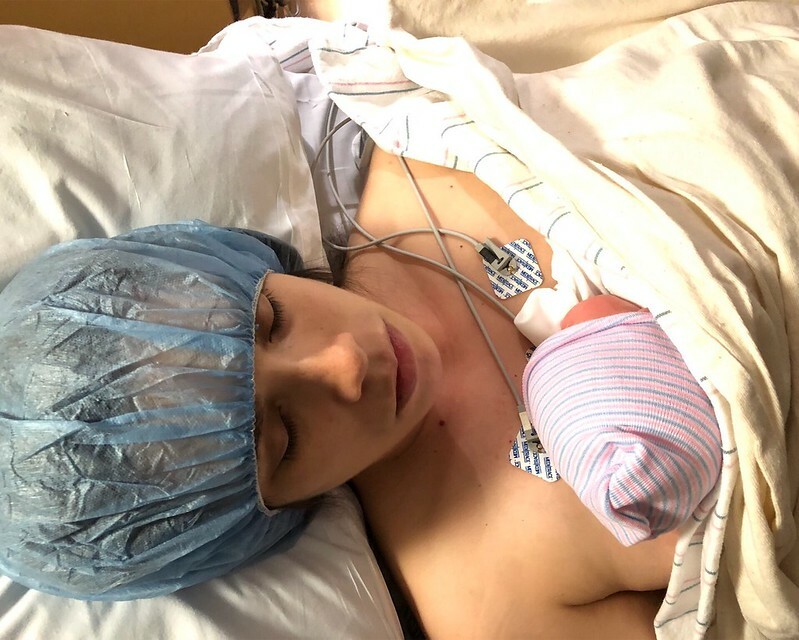 I spent a lot of time preparing for the possible things that could happen during delivery, but the one thing I never planned for was a c-section. If I had it to do over, I would know to make sure I had the above things on hand (if I didn’t already have them), as a relatively simple way to make sure I was prepared for everything. And, seriously, that robe is awesome and I still wear it to and from the shower every morning! In this series, I’m giving my partner, Dan, his due as a fantastic partner at all stages of our journey to parenthood. Today, I’m going to talk a little about how he prepared for and participated in the birth of our child. I can honestly say that Elliot’s birth would not have been the largely positive experience that it was without Dan’s help. 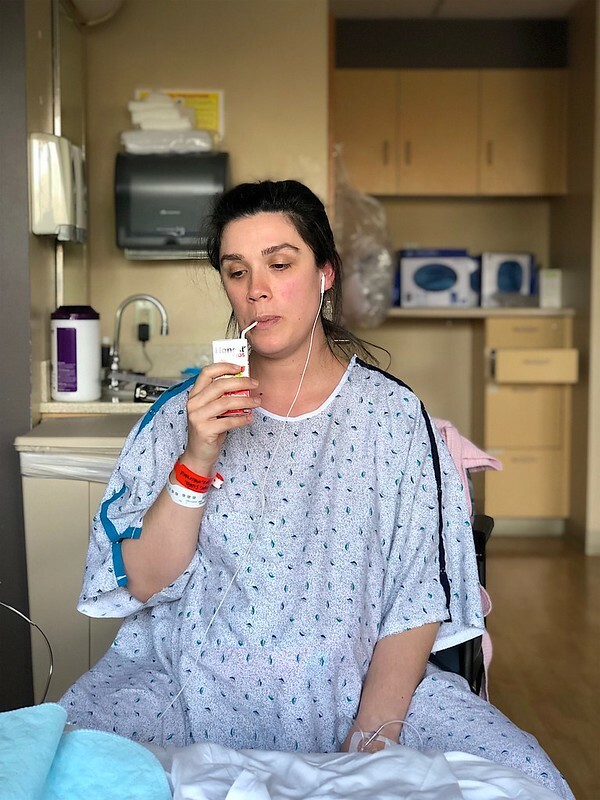 I’ve already told the story of Elliot’s birth and how I used my Hypnobabies techniques to keep calm and mostly comfortable during labor, especially before getting an epidural. I’ve also talked about how my first epidural started failing on one side because it was improperly placed and I had to have it redone while experiencing the height of pitocin contractions. But that’s the middle. Let’s start at the beginning. First of all, though he was dubious about its effectiveness, Dan was always willing to participate in the Hypnobabies training. 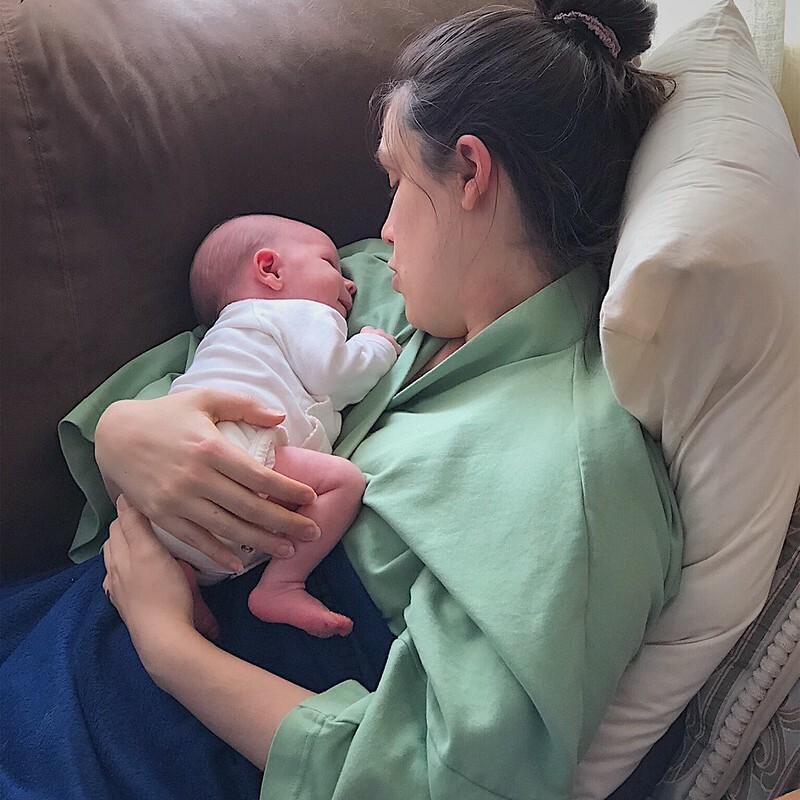 He took to the scripts and the cues right away, and I felt confident that he would be able to help, which made the anticipation of labor less scary. We checked into the hospital at 4pm the day of my induction and he stayed with me for the entirety of my hospital stay, which was almost 36 hours of labor, a c-section, and four additional days, sleeping on couches and staying up all night to soothe the baby so I could rest and recuperate as much as possible. When we first got into the perinatal room, he helped figure out the TV options while I chatted with the nurse, and later on, he made sure that I could comfortably eat while mostly stuck in bed because of the monitors. 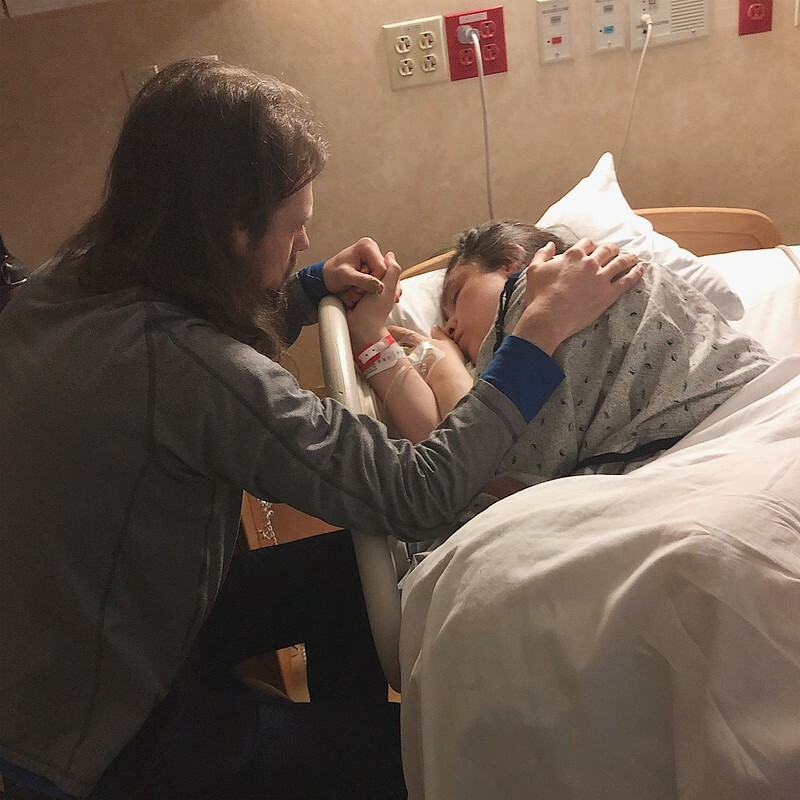 Other than the time he spent sleeping the first night (I was pretty oblivious to my increasing contractions while on Cytotec, so I let him sleep as much as he could), he was engaged in the process and made sure to touch base with the nurses to know what was going on. He also was in charge of bringing my cold snacks to the nurses’ station to get them refrigerated, and then fetching gelatin and broth for me later on. I ate a lot of gelatin after we moved to labor and delivery. But Dan truly started to shine when my contractions became more intense on pitocin. I had a private conversation with him that I was thinking I should get an epidural before I mentioned it to anyone else, and he supported me, while also encouraging me to wait until I talked to the doctor and the doula again, so that I didn’t regret getting it too early. When I did finally decide it was time for the epidural, he was right there with me, helping me relax through the contractions while I had to sit up for the anesthesiologist. And when that epidural failed and I didn’t think I could keep going on, he was right there with me. I’m so glad our doula was able to snap the picture above of him comforting me through what would turn out to be the worst part of my labor experience. When I had to sit up for the second epidural placement, he was right there with me, helping me with relaxation cues to help me through the contractions while staying still for the epidural. I honestly don’t know if I would have been able to do it without him. Eventually, we decided that it was time to move to the c-section, and I was so glad they allowed him in with me. I had to go in first, to get prepped, and then they showed him in. I was having really bad shakes from the spinal and it was making me anxious, which made me shake even worse. As soon as Dan came in and sat next to me, he started using Hypnobabies cues and some tricks the doula showed him to help me relax. Even though he claims it didn’t look like it made a difference, I felt much more relaxed and felt like I was shaking less. Once Elliot came out (greeting the world with a fountain of urine! ), Dan was the one to cut the cord and held him the rest of the time the doctors were finishing up. And once I was back in recovery, doing skin-to-skin time, Dan and my nurse made sure to watch us so that I didn’t have to worry about feeling drowsy from the effects of the anesthetic (and over 36 hours of labor and surgery with very little sleep!). Throughout our hospital stay and the weeks after, he was the one who made my recovery possible. When I had trouble picking up Elliot because of my incision, he reminded me that most people who have abdominal surgery are told not to lift anything, rather than “nothing heavier than the baby,” so that as long as I had him to help, he would do the lifting. Every night when Elliot woke up to nurse, Dan was right there to pick him up out of the bassinet and hand him to me. Sometimes, Dan is better at soothing him to sleep than I am! His quiet resilience and willingness to help with everything that was possible for him to do made it possible for me to rest and recover from my surgery, while his emotional support has helped me through some of the mentally toughest moments I’ve had. I feel lucky to have such good support and know Elliot feels lucky to have such a good dad. Well, I’ve finished my first week of the Hypnobabies self-study course at home, and I thought I’d share some of my thoughts thusfar. I’m finding the program really interesting, and I think it will be helpful for my childbirth experience, regardless of whether it’s the only comfort measure I use. Specifically, I’m finding that I really appreciate the daily relaxation and meditation break that the practice involves because a fair amount of my pregnancy has involved worry about both the pregnancy and the birth at the end. Week one is really more of an extended introduction to the Hypnobabies program, and to the idea of self-hypnosis in general. It’s interesting because the week one slides hint at things to come, but don’t really delve into the specific self-hypnosis techniques that you’ll learn later on. The main takeaways from week one, for me, were the importance of focusing on positive birth experiences, retraining your mind to think of childbirth as a positive, empowering thing, and using the special Hypnobabies language around pregnancy and birth. It definitely seems hokey at first to call “labor” “birthing time” and “contractions” “birthing/pressure waves,” but as someone who has used meditation in the past, I understand the necessity to challenge and rewire your brain on a deeper level. And it’s nice for me, as someone who has anxiety, to take concrete steps towards reducing my anxiety around the idea of having to actually birth the baby at the end of this. 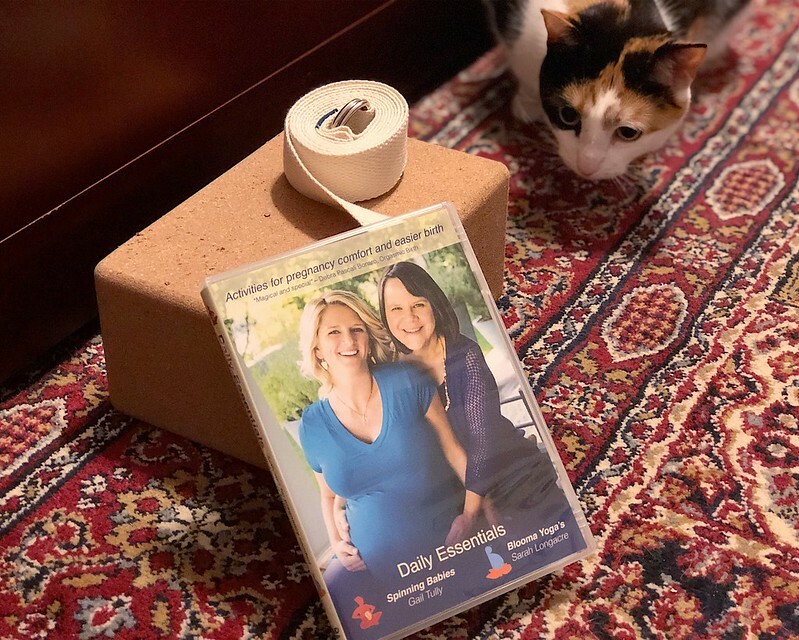 I will say that I think the two hypnosis tracks from week one, plus the pregnancy affirmations track, would all be appropriate to use earlier on in your pregnancy. I think if I ever have another baby, I’d probably start listening to the three tracks from week one earlier on, and start the official course with week two later on in my pregnancy. Now, affirmations are seriously not my thing. But I was able to find a meditative space where they were helpful. Oddly enough, I’ve used mantra meditation in the past, but it was always in Sanskrit, so there was less involvement from my conscious/analytical mind when I repeated a mantra. It was merely a way to focus my mind and keep it from wandering. So by treating the pregnancy affirmations the same way, I found a kind of meditative benefit from them, except that rather than listening to them only while sitting in meditation, I would listen to them whenever I had 40 minutes to do so. I listened to them at work while eating lunch, while commuting, while falling asleep at night, and any other time I could snag a chunk of time. I definitely feel more calm and positive about the idea of giving birth after listening to them, even if I don’t always pay attention to every word. Similar to my comments about the positive affirmations in some of the Circle + Bloom meditations, there is a sense with these that you have to accept the positivity and not try to argue with it, which is easier if you’re not fully paying attention and analyzing them the whole time. This was the first self-hypnosis track that I listened to during the program, and it’s really more of a guided meditation and visualization, although I imagine the visualization is going to come into play later on in the program when you get into the deeper hypnosis tracks. I enjoyed this track more than I thought I would, probably because I realized that my “special safe place” is actually a real place that I go semi-regularly and just makes me feel happy and relaxed. The photo above is from it: the deck of my in-laws’ lakehouse early in the morning when most everyone is still asleep and it’s very cool and quiet. So having a guided visualization to take me there was a profoundly relaxing experience during my pregnancy, especially since later pregnancy has made the 5-hour-plus drive to get there sound less appealing. This hypnosis track is more of a guided deep relaxation, followed by an explanation of the benefits of the Hypnobabies course, in my opinion. I enjoyed the deep relaxation, and I could see how hearing the course material while in deep relaxation could help, but I’m pretty sure the main point of this track is to get you used to entering and being in deep relaxation to prepare you for the physical sensation of hypnosis later on. But it’s a nice way to relax, at least. So that’s my recap of the first week of Hypnobabies home-study. I’ve already moved on to week two, as I realized that reading all the slides and course handouts on Sunday helps prepare me to more fully focus on the hypnosis recordings the rest of the week. I’ll check back in next week to let you know how it’s going. So first of all, I wanted to start this by saying that I am not a die-hard “natural” (i.e., unmedicated) birth advocate. In fact, I went into my pregnancy fully accepting that I would probably end up getting medical pain relief. Now, as I learn some more stuff about options for pain relief, I’m starting to realize that I actually want to make more of an effort to avoid an epidural, but that’s neither here nor there. The main reason I started looking into unmedicated birth techniques was because, if everything goes as planned, I will certainly not have the option of having pain relief at the beginning of labor (I have heard that you can get an epidural before starting pitocin if you get induced, but for the most part, everyone starts labor unmedicated) and I don’t really want to be floundering because I just assumed that “epidural, please” was sufficient thought to give to pain in labor. Second, if you’re familiar with Hypnobabies, you’ll notice I’m using “unapproved” language to refer to labor. That’s mostly because it’s the words that my general audience will be most familiar with. But more on that later. I was given the suggestion of Hypnobabies from my doulas. They suggest it over other self-hypnosis techniques because they consider it a more complete course on childbirth. I found the technique of self-hypnosis intriguing because of my past experience with meditation and deep relaxation. I’m already familiar with a lot of the breathing and relaxation techniques used in hypnosis, so I figured it would be a pretty natural progression, plus I know I’m personally willing to accept that I can effect changes in my body through a mind-body connection. I chose to purchase the Hypnobabies self-study course because my doulas’ recommended class is pretty far away from me, and I know my husband tends to giggle when he hears the term “hypnobabies,” so I can’t really take him anywhere. I purchased the class around 26 weeks pregnant, and recently started downloading parts of the course. I went ahead and went through the Introduction last week, and spent the weekend downloading the first week’s audio files, and started going through the course material this week. Starting at 28 weeks means that I will finish the six-week course around 34 weeks, giving me 3-6 weeks to maintain my progress. This week, I’m going to give my general impressions, mostly from the outside, after having read the introductory material and listened to a few audio tracks. Then, each week, I’ll do a recap of how I found the previous week’s work. So the introduction is mostly an introduction to the structure of the course and the concepts behind self-hypnosis. Self-hypnosis involves putting yourself into a deeply relaxed state, where your subconscious mind is more suggestible to changes in your thinking about a specific topic, in this case childbirth. So Hypnobabies training ultimately aims to reset how your brain thinks labor will go. The idea is that you can change your thinking from assuming childbirth is a scary, painful thing, to thinking that it will be more manageable. From there, you also learn specific techniques to put yourself into a self-hypnotized state to help you cope with any parts of childbirth that are less than completely pleasant (i.e., painful). So when you go into labor, you can use self-hypnosis to get through specific contractions, while still being present mentally and able to interact with others between contractions. The structure of the class is a bit more intensive than I expected. By way of comparison, if Circle + Bloom was a “get fit in 30 minutes a day” kind of program, Hypnobabies is a little more like meditative P90X. You will spend an hour or so each day listening to specific audio tracks, one that trains you in a specific self-hypnosis technique, and one track of birth affirmations. At least the birth affirmations don’t involve deep relaxation, so you can kind of listen to them any time (I like to listen to them at lunchtime at work). You also get a slideshow of each week’s lesson, which probably takes at least an hour to get through, if you do it all in one sitting. Personally, I’m going through one or two chapters per day of the weekly course slides right now. There is also a downloadable booklet that has an overview of the Hypnobabies techniques, plus a supplement specifically for the birth partner, which you can print out and take with you to the hospital (or wherever you give birth). It’s a lot of material, but you take at least six weeks to get through it. One final note: Those of you who remember my post from last week about complaining about pregnancy might wonder how the positive thinking message of Hypnobabies meshes with my personal belief that you shouldn’t be afraid to complain about your pregnancy. Well, even the Hypnobabies material says that you should never consider that self-hypnosis requires you to ignore or overcome what you are currently experiencing. Yes, they want you to focus on positive feelings and thinking, but first you should accept where you are. Then, the self-hypnosis techniques can help you train your brain to help you move past fears and complaints, similarly to how cognitive behavioral therapy helps you move beyond anxiety. I actually find the techniques and affirmations pretty compatible with how I feel, given that they’re up front about the fact that you’re not actually expected to completely believe all the affirmations from the get-go. That’s the point of training for six week! So that’s my first impression of starting Hypnobabies. Join me next week to see how my first week of the course went!